Before we begin, an important disclaimer: I am not a lawyer, and the following does not constitute legal advice. Seek legal counsel if your company is dealing with any kind of lawsuit. 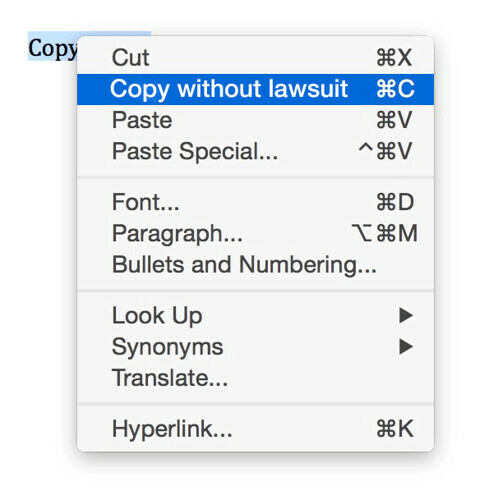 Few sentences in the English language have started more lawsuits or cost companies more money than this one. Copyright law governs content, and failing to understand copyright law can expose your company to significant legal damages. How much? At a former company I was at, an intern used a photo from a major stock photo service that they found via Google Images on the company website. We received a legal notice that said if we do not pay $60,000 in damages and remove the photo, we would be sued for significantly more and our Internet Service Provider would shut down our company website for piracy, which would cost millions of dollars in lost revenue. All of that from one misused photo. As content marketing becomes an ever-increasing part of marketing programs, the possibility of copyright violation increases. As more people enter the content marketing profession who do not have any legal background or understanding of copyright law, more content contains the potential for legal damage. For PR and marketing professionals that are agency-side, there’s an even bigger whammy: if you infringe on someone’s copyright, both you and your client may be sued for damages. How do you avoid infringing copyright? First, it’s important to understand the basics of copyright. In the United States and a fair part of the world, copyright is an automatic right. The moment you create something, copyright applies to it. The moment I finish writing this blog post, it is copyrighted, regardless of whether or not I submit it to a third party like the US Patent and Trademark Office. Even if I never published this blog post, it would still be copyrighted. Any piece of content is automatically copyrighted – an Instagram photo, a Pinterest Pin, a Facebook meme, etc. No matter what the source is, content is automatically copyrighted. Under copyright, the owner of the copyright has 5 major rights. They have the right to reproduction, which means they can say who can or cannot reproduce their work. If someone were to copy this blog post and paste it on their own blog without permission, that would be a copyright violation. They have the right to derivation, which means they can say who can or cannot make derivative works. If you take a screenshot of only part of an image, or rewrite someone else’s blog post in your own words, and publish it without permission, that would be a copyright violation. They have the right to distribution, which means they can say who can or cannot share their work, including sale, import/export, sharing, and commercial trade. If you share an eBook for lead generation purposes that has someone else’s material in it without permission, that would be a copyright violation. They have the right to public display, which means they can say who can or cannot post their works publicly, including on the Internet. If you share someone else’s work without permission in public, including online, that would be a copyright violation. They have the right to sell, transfer, or license their rights, which means that they can legally appoint someone else the copyright holder or grant permission to use the item. If you commit any of the above infringements and there’s more than one copyright holder, you may find yourself facing a massive lawsuit from a deep-pocketed corporate legal department. So what content are you allowed to share? First, if you secure written permission from the copyright holder, that trumps everything. “Without permission” is the key to all of the above copyright infringements. Ask, ask, ask! When in doubt, ask. If you secure permission, you’re in the clear. Public domain: a copyright holder may choose to waive their rights and place a work in the public domain, which means anyone can use it without needing prior written permission. Look for a PD logo and/or a written statement that something is in the public domain. Creative Commons: a copyright holder may choose to grant certain rights without requiring advance permission, such as sharing or making derivative works, even for commercial purposes. Look for a CC logo and a disclosure or link on the work that states what rights have been granted. Additionally, some entities are exempt from copyright. Works produced by the United States government (but not contractors or private organizations) are generally exempt from copyright, so when you get charts from the Bureau of Labor Statistics, you can work with them without prior written permission. Finally, there are limitations on copyright called Fair Use Doctrine. However, Fair Use Doctrine is enormously complicated and fraught with legal risk. If you have a choice between using an approved license above vs. pursuing content that you may believe is covered under Fair Use, use the licensed works first. If you choose to pursue re-use of someone else’s content under Fair Use, we strongly recommend that you seek the counsel of a qualified intellectual property attorney to guide you. Just because it’s on the Internet doesn’t mean it’s free or that you have permission to use it. Is this already pre-licensed, and can I use it under the terms of the license? If the answer is yes to both, you’re good to go. Did I get advance permission in writing? If the answer is yes, you’re good to go. Anything else may be treading on thin ice over an ocean of litigation, so step cautiously! What’s Your Multi-channel Social Media Strategy?